Geethanjali College of Engineering&Technology, Telangana has advertised in THE DECCAN CHRONICLE newspaper for recruitment of JRF jobs vacancies. Interested and eligible job aspirants are requested to apply on or before 30/05/2018. Check out further more details below. 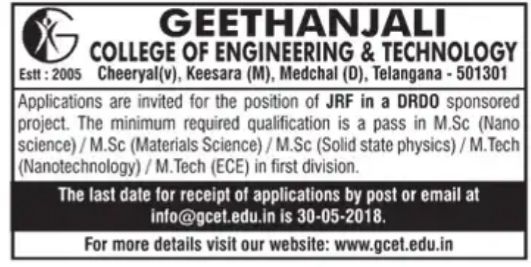 About College:Geethanjali College of Engineering & Technology has been structured to take head on the changing trends of technology. The idea of setting up the college emerged when no other college could cater to the needs of a student in his/her endeavor to acquire wholesome education. The very strength of Geethanjali lies in its principles of providing the right learning environment for the student who does not have to compromise throughout the learning process of becoming global citizen. JRF in a DRDO sponsored projects. Minimum required qualification is a pass in M.Sc(Nano Science)/M.Sc(Materials Science)/M.Sc (Solid State Physics)/M.Tech(Nano Technology),M.Tech(ECE)in first division.